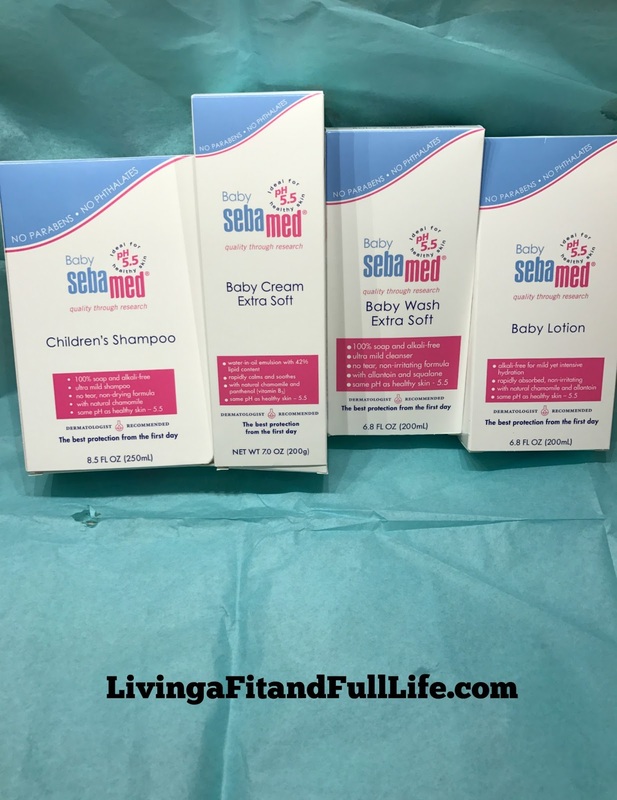 Living a Fit and Full Life: Sebamed Baby and Children's Products for Healthy Skin! Sebamed Baby and Children's Products for Healthy Skin! In 1967, German doctor Heinz Maurer introduced the world to a new cleansing bar after realizing that most people weren’t paying enough attention to the most important part of their skin -- the skin barrier. Skin care would never be the same again. Through extensive research, Dr. Maurer discovered that skin care products with a pH level of 5.5 help support the skin's natural barrier. Part of the function of the natural barrier, also called the acid mantle, is discouraging the growth of bacteria and protecting the skin from outside irritants. In Germany, Dr. Maurer is credited for pioneering the first soap-free bar with pH 5.5--the pH value of healthy skin. The initial Sebamed product was a soap-free cleansing bar which was suitable for cleansing of problematic skin such as rosacea, psoriasis and eczema due to its mild formulation. Today, Sebamed is sold in over 85 countries and has changed the lives of people from all over the world. Traditional soap may help clean you, but it may not always agree with you. It has a pH of between 9 to 10 which is too alkaline for sensitive skin. Most consumers aren’t aware that healthy skin has a pH level of 5.5. Typically, they opt for prescription medications to help a skin problem without realizing that proper skin care which supports skin's natural barrier can be important. Sebamed brings that healthy level of pH 5.5 to customers. More than 120 scientific studies have tested the high effectiveness and skin compatibility of all Sebamed products and confirm their skin care competence for sensitive and problematic skin. Sebamed brings that healthy level of pH 5.5 to customers. If you’re dealing with rosacea, eczema, psoriasis, acne, sensitive skin, or just looking to maintain healthy skin, Sebamed offers a variety of collections. Each line serves its own purpose and is formulated to the same pH level of 5.5, whether it’s our classic collection for sensitive skin, our baby care, anti-aging, or our acne lines. From hydrating lotions that soothe irritated skin to facial toners that continue a youthful glow, Sebamed has the type of skin care products you are looking for. Our Baby Wash Extra Soft - 200 ml gently cleanses your child's skin with a mild formula. Your baby’s extra-delicate skin requires the best care – and that means bathing baby with soap-free body wash. Our Baby Wash Extra Soft was created without soap to help protect your child from skin rashes, dryness and other skin conditions that can result from using harsh cleansers. For a complete care routine for your little one, moisturize their skin with our Baby Lotion or Baby Cream Extra Soft after every baby’s bubble bath. 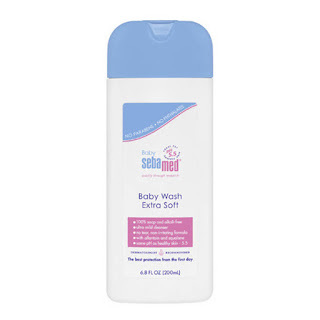 Unlike regular soap that can cause dryness and irritation, Sebamed Baby Wash's ultra mild emollient formula supports the moisture balance of your baby's delicate skin. Gentle enough to use every day, this moisturizing cleanser naturally softens and soothes with allantoin and squalane to keep even the most sensitive baby skin at its huggable, healthy best. Sebamed pH 5.5 All Baby Sebamed products are meticulously formulated to naturally protect a baby's delicate skin. A newborn's skin lacks the natural hydrolipid protective barrier, which is established during the first few months of life. Every Sebamed product has a pH balance of 5.5 to help support this barrier. Baby Cream Extra Soft is a deeply moisturizing lotion that helps to support your baby's skin from their very first day and is among our paraben-free baby products. Babies require extra-soothing lotions because their natural skin barriers are still forming. Our Baby Cream Extra Soft is uniquely formulated to care for your child’s vulnerable skin, reinforcing their still-developing acid mantle. Our special moisturizer is non-greasy and helps to protect your baby’s skin from becoming dry. Number 1 hypoallergenic German baby cream dermatologically tested and recommended in its category. Also without phthalates. For intensive protection of baby's delicate skin, this rich water-in-oil emulsion with 42% lipids forms a moisturizing film without interfering with the skin's \"breathing\" and metabolic processes. Natural allantoin and the moisturizing agent sodium lactate support the delicate baby skin from drying, making it soft and smooth. The herbal extract camomile soothes irritated skin particularly in the usual areas of contact chaffing (elbows, knees). Well suited for the prevention of nappy rash dermatitis, Sebamed Baby Cream lotion with pH 5.5 supports the development of the skin's protective acid mantle. Furthermore vitamin E safeguards against harmful environmental influences. The lipid concentration of the cream help protect baby's face and hands during cold weather. 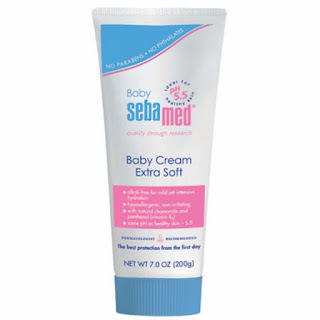 The Sebamed Baby Lotion - 200 ml deeply moisturizes baby's skin, helping to protect them from skin conditions at an early age. The best baby skin care begins with pH-balanced barrier support – and that’s exactly what our specially formulated Baby Lotion provides. Made to gently moisturize your child’s delicate and developing skin, our lotion helps to guard against dry skin and skin problems such as psoriasis and diaper rashes. Apply a generous amount after bathing to seal in moisture and keep your baby feeling snuggly and soft. The Sebamed Children's Shampoo - 250 ml gently cleans your baby's hair. Many popular shampoos for babies contain soap or other harsh chemicals. By contrast, our dermatologist tested children’s shampoo is specially formulated to hydrate your baby’s hair and scalp, supporting healthy growth. And because it is soap-free and made at a pH level of 5.5, you never have to worry about it drying out your child’s skin or hair. Instead, it deeply cleanses without irritation to help protect your baby’s sensitive scalp. NO TEARS FORMULA For the delicate scalp and fine hair of babies and children from birth to adolescence. Baby sebamed Children's Shampoo with its pH value of 5.5 supports the development of the scalp's physiological acid mantle. The 100% soap and alkali free mild emollient formula is the ideal care for the hair and scalp of babies and children. Its gentle cleansing action minimize the risk of dryness or irritation due to the excellent skin tolerance. Herbal extracts from fennel, yarrow, melissa, mistletoe and camomile alleviate irritation and soothe the skin. 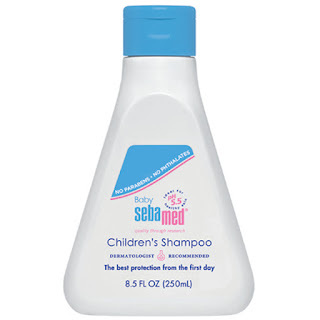 Baby sebamed Children's Shampoo leaves the hair fragrant, silky and easy to comb. Promotes a healthy scalp for the growth of healthy hair. Free of colorants, nitro-mochus compounds, formaldehyde, nitrosamines and dioxan. Sebamed Baby and Children's Products for Healthy Skin! I have 4 kiddos who all seem to have inherited my eczema and overall dry skin. Sebamed Baby and Children's Products have helped heal my kids eczema and my kiddos definitely don't seem to be bothered by dry itchy skin anymore. Sebamed products are extremely gentle on both baby and children's sensitive skin and contain ingredients to help soothe and heal. I also have to admit that I often sneak the kiddos Sebamed Baby Wash and Lotion when my skin seems to be a little dried out and after just one use I notice a huge difference. If your kiddos or even you suffer from dry skin, sensitive skin or eczema I highly suggest Sebamed products! Click HERE to find a store near you that sells Sebamed! Click HERE to learn more about Sebamed!